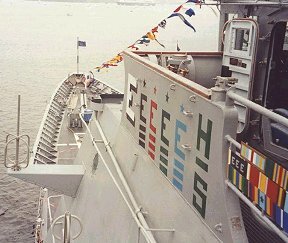 The letters painted on the ship's bridge wings are known as Command Excellence Awards or Command Effectiveness Awards. These awards mean that the ship that bears them has proven to be superior in a certain field of operations. The probably most important award is the Battle E. There is only one Battle E award per squadron and only one ship in the squadron wins it every year. The Battle E award shows that the ship that bears it has proven to be superior in ship handling, weapons employment, tactics and ability to fulfill mission objectives. The importance of the Battle E is also represented by its appearance: The white E is twice as large as the 'common' E's and it's the only award with shadow. But all this does not mean that the other awards are unimportant: A lot of the training aboard a ship during the year is not only to maintain proficiency, but to try and win these awards. The varying colors tend to represent different departments aboard the ship while the varying letters represent different activities. Awards are only valid for one year. Afterwards they have to be removed if the unit does not qualify for the award again. If a unit won an award and qualified for the same award the next year, the first award is underlined (service stripes). So if a unit bears a triply underlined E, the unit has won the award in four consecutive years. 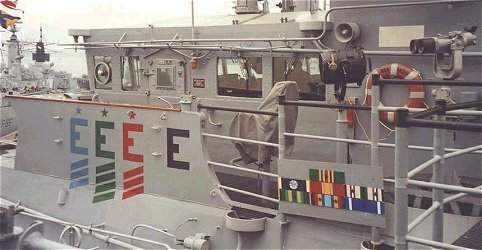 Instead of the letter and four service stripes for winning the award five consecutive times, in the case of the Battle "E", a gold "E" shall be displayed with a silver star above the "E". In the case of the command excellence awards, an "E" and a star of the same color will be shown for the fifth consecutive award, replacing the service stripes. Another star shall be added for each five successive annual awards. All awards, except the Battle E, are 20 inches in length and 25 inches in height without shadow. Battle E - Award for the best ship handling, weapons employment, tactics and ability to fulfill mission objectives (command and control). Only one award per squadron. E Excellence Award for the best Propulsion and Engineering Crews. E Excellence Award for the best Supply Departments. E Excellence Award for the best Air Departments on board the aircraft carriers. F Award for Fire Control Excellence. C Excellence Award for the best Communication Departments. A Award for Antisubmarine Warfare Excellence. DC Excellence Award for the best Damage Control Crews. CS Award for Combat Systems Excellence on board the Aircraft Carriers. H Wellness Award for the best Health Promotion Activities. Units have to apply for this award. M Excellence Award for the best Medical Departments. N Award for Navigation Excellence. T Excellence Award for Tactical Proficiency. R Award for Repair Excellence. D Excellence Award for the best Deck Departments. W Excellence Award for the best Weapons Departments on board the Aircraft Carriers. DS Excellence Award for Deep Submergence. S Excellence Award for Strategic Operations. Back. Back to first page.